Freshman guard Sean Williams scored 14 points coming off the bench on Tuesday Jan. 29 as the St. John Fisher men’s basketball team defeated Utica College at home by a score of 91-64. Williams tied senior teammate Ryan Henderson for the team high in points. The freshman also added four steals to his already team leading total of 26 for the season. The Cardinals also saw the return of their star, Sammy Robinson. The junior returned to the court after missing two straight games due to an elbow injury. Coming off the bench for the first time this season, Robinson added eight points and a pair of rebounds. Utica freshman Avery Coston led the game in scoring, putting up 29 points for the Pioneers. In a game that was truly a tale of two halves, the Cardinals started the first falling behind after two early three-pointers from Coston. The Cardinals responded with a few baskets of their own starting a back and forth battle that resulted in a chippy final five minutes of the half. With 32 seconds remaining, Utica freshman Shawn Gashi took the ball strongly to the hoop scoring an ‘and one’. Gashi then added some embellishment which drew a reaction from the Cardinals’ Robinson, resulting in a technical foul against the junior forward. After the dust settled, the first half score read 39-37 in favor of St, John Fisher, a lead they would never relinquish. The Cardinals exploded into the second half going on an 18-0 run in the first six and a half minutes. The run was highlighted by important baskets from sophomore Matt Asenjo and senior Ryan Henderson. Following the run, the Cardinals never let up. 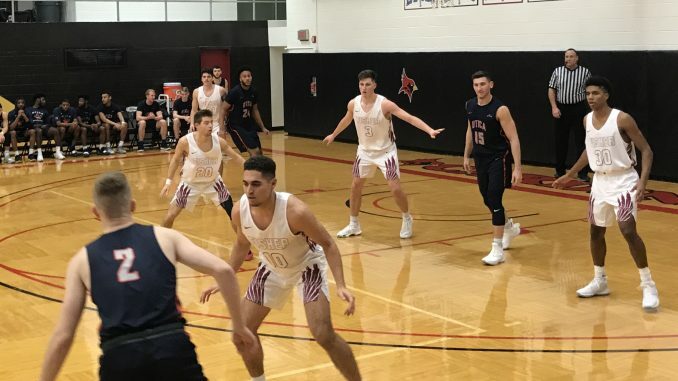 Applying full court pressure for the remainder of the second half, they were able to disrupt the fast paced Pioneers’ offense and cruise to a victory. After losing in their two previous games it seemed as if the return of leading scorer Robinson really provided a much needed spark to the younger Cardinals, especially Williams. During warmups and timeouts Robinson often takes time coaching and mentoring his younger teammates, something he takes pride in as a leader. Following the game Robinson referred to Williams as “a real crowd pleaser,” adding that he enjoys watching him play, and recognizes the spark that Williams provides on and off the court for the Cardinals. With the win over Utica, The Cardinals improve to 11-6 overall and 6-2 in Empire Eight play. The men’s basketball team will be back on the court this Friday, Feb. 1 as they travel to Hoboken, New Jersey to face Stevens Institute of Technology. In the women’s portion of the home doubleheader, Fisher also defeated Utica, 63-49, to raise the women’s team’s record to 11-6 overall (5-3 in Empire 8 play). Balanced scoring was the order of the day, as Ella Eckert scored 13 points, Erin Hulbert had 12, Sydney Masna had 10 and Miranda Lynch scored 9. Eckert matched her point total with 13 rebounds while Hulbert had five assists to lead the team in that category.